Last edited by Former MSE Wendy; 21-10-2015 at 10:52 AM. You mention that the current fees are £3,290, but for 2011 they are going to be £3375, we don't want students coming in September thinking they will be getting charged the lower amount. Thanks for doing the guide, it will really help us explain the situation to future applicants. would it be worth announcing the article on the student board too? that's where most of the discussions about this have been going on for a while already. Another thing I am not 100% on, is that on DirectGov it states the interest rate is RPI + 3% until you start repaying not until you graduate, which is what you have stated in Section 6. So those that are unemployed or earning under £21k after university will continue to be charged RPI + 3% rather than going to the RPI rate for earning less than £21k, even though the rates are RPI for those earning under £21k and states on the next line on that it is based upon when you can possibly earn rather than when you start repaying. Interest is charged on your loan while you’re studying. Until you start repaying the loan, interest is charged at the rate of inflation plus three per cent. When you're due to start repaying your loan the amount of interest you're charged depends on how much you earn. Seems like a very contradictory paragraph. Last edited by Lokolo; 10-06-2011 at 12:35 PM. thanks uni-worker - we're getting it changed now! Hi Lokolo, there's more info on this Student 2012 Direct.gov page, which we've verified, but thanks for mentioning, just in case! I work in a Univ admissions office and we are really in the dark about how the scheme will work in practice. E.g. 1. Can you repay early or are you locked in for 30 years? 2. May a student pay their own fees for (say) one year and then take out a loan for the remainder? 1. It is very unlikely you will be locked in for thirty years - but there is a debate whether you will have penalties for repaying early. And I doubt it will be decided in the white paper - it looks like it will go out to consultation. 2. You do not need to take a loan for fees, you can pay instead (though as you'll see in the guide for most people the financial mathematics on that is likely to look bad even if you can afford it). It's a great guide so far, and can only improve in time. One thing I will say, are there plans to include perhaps a guide to make sure everyone gets their full entitlement? I say this, as from experience SFE do give incorrect information. I would be happy to write up such a guide from the point of view of an ex-assessor at Local Authority level if this would be of interest. I think you need to revise your repayment model for FAQ 17. 1. The government's 'intention' (I use this term advisedly) is to index link the thresholds to general wage inflation not graduate pay. Wage inflation is currently around 2-2.5%. I think it is best to assume it as a similar level to RPI. Otherwise, what becomes apparent from your scheme is that the government could not afford this scheme - too few people would repay the loans. 2. The interest rates and thresholds will not be set in primary legislation but treated as administrative matters. Until we see the terms of the loan agreements which individuals sign, it is not clear what protection there is for individuals against future governments changing the terms or, indeed, selling off the loans to third parties. (Loans can be sold without consultation and without consent - see 2008 Sale of Student Loans Act). 3. The 2011 Education contains a section allowing the government or third parties to set commercial rates of interest (or higher in certain cases) on student loans. Part of your campaign for financial education needs to involve reading contracts and understanding how and when terms and conditions might change. The comments about tuition fees being equivalent to a graduate tax are highly misleading and could be construed as political spin. For example, the table in section 18 shows that high-earners will pay back a smaller gross total over the loan period than those on middle incomes. When viewed as a proportion of the total income (the strict definition of tax progressivity), it is apparent that tuition fees are highly regressive between middle and high incomes. This is an important political discussion point, as the proposals for a graduate tax advocated by the likes of the NUS are progressive. The Lib Dem official policy calls for HE to funded through progressive taxation (income tax). Such schemes would be similar to income tax, not just in terms of the source of the taxation, but also in terms of progressivity. Tuition fees are clearly regressive in the strict sense and comparing them to a graduate tax is, in my opinion, misleading and politically charged. Last edited by joguest; 11-06-2011 at 12:14 PM. Given the current administration's (and the previous one's) changes to primary legislation for it's own employees in respect of both civil service redundancy terms and pension arrangements, can anyone genuinely rely on a government's claims to hold terms and conditions? How long will it take for a "it's not fair that they only pay so little" campaign to start up? Another "them and us" type approach aimed at reducing the quality of life for everyone on the basis that some don't get the same "favourable" terms? A great guide. I have one concern. The assumption that RPI is 3%. The problem is that RPI is currently 5+%. Barclays Capital is predicting RPI at 6.4% by October. Maybe over 30 years 3% RPI is a valid assumtion but right now it doesn't reflect reality. At RPI 5% plus 3% these loans will have racked up interest of c£8,000 before students graduate. That's another £8k that will be attracting interest for 30 years. Surely this should be taken into consideration when weighing up the cost of one of these loans? Maybe this wouldn't be an issue if wage rises were keeping up with inflation but they aren't. Last edited by setmefree2; 12-06-2011 at 8:25 AM. I can't believe you aven't removed the bit about the graduate tax yet. "The amount paid increases with earnings "
That's clearly untrue - if you have a look at the table in section 18. The coalition government explicitly rejected the idea of a graduate tax in favour of tuition fees on the basis that they were concerned high earners would leave the Country with the prospect of high taxation. Tuition fees clearly leave high earners paying back not just less money as a proportion of their income (i.e they are regressive in tax terms) but also LESS money. You cannot, therefore, compare tuition fees to a graduate tax - I'm not aware of any income tax system in the world that is regressive. We must make it clear that, whilst the repayment system may work like a graduate tax, the fact is that this is a loan which is incurred from the start of studying at university and it will remain with the student even if they do not graduate. Students who drop out will carry the debt with them. A large proportion of part-time students do not complete their degrees. A substantial number of full-time students, varying from 20% to 5%, do not complete their degrees. They need to know that they will still have to repay the loans. What's struck me during the process is how marked the changes caused by a tweaked assumption have been. It will be really interesting to eventually find out the levels set by government, and how they affect repayment amounts and timescales. When the amount of student grant is worked out...are parents savings taken into account ? I have been led to believe they are BUT any money in ISA`s is not...is this correct ? FAQ 17 - Let's see this based on the full £9,000 that the majority of universities are going to charge. General - let's have an article on studying abroad and a cost comparison of that. I have children of 15 and 12. I earn good money by a lot of peoples standards but not enough to support £100,000+ of debt after they go through university when their time comes. If they want to study at university, I will be whole heartedly recommending that they do it abroad. I cannot see how any sane parent with an income above the levels that mean their children get no support can ever recommend their children embark on 30 years of DEBT at the tender age of 21. The whole scheme is nothing but the establishment wanting to start a social divide so that university education becomes only available to their own. Forget what's happening to the NHS - tuition fees is MUCH, MUCH worse. Advice to any intelligent kids out there - go abroad to study, make a new life for yourselves and give this country nothing - it is giving nothing to you. Our eldest is in the middle of his A2s so he just gets in before the old regime closes its doors. 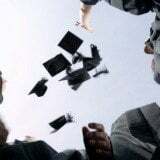 We are in the fortunate position of having an endowment plan which matures on 1st Sept so have made the decision not to apply for a student loan for him. One of the main additional reasons for this - and which is relevant for 2012 - is the nightmare of the Student Loans Company and all the blogs, postings on MSE etc, which tell of horror stories getting a loan, reapplying each year and then difficulties in stopping deductions when the loan has in fact been paid off. Younger sibling will be off to Uni in 2017 hopefully so we are just trying to save like hell to minimise the amount of loan she has to take out. Dad will be retired by then which is another worry. Please keep campaigning to reverse the idea of penalising students who pay off their loan early. That's not why I voted Lib Dem, Mr Clegg! !